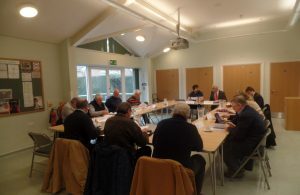 Local businesses, community groups and other key members came together for Hailsham Forward’s latest stakeholder group meeting, which was held at Diplocks Hall this morning [25 January]. This year’s town community events and support for local industrial parks were just a few of the items discussed by the ‘Town Team’, which aims to bring together key local stakeholders including Hailsham Town Council to review the best ways to revitalise the town centre and surrounding urban environment. At the meeting, members were updated on suggestions for infrastructure improvements in the town, the continued success of the Hailsham Community Forum, and the reduction in empty shops in the town centre which has resulted in several new independent businesses opening in recent months. Also discussed was the recent expansion of the Town & Shopping Guide directory’s content with new businesses added, the continued popularity of the Hailsham Loyalty (Card) Scheme and upcoming Hailsham Forward projects, including the creation of a virtual shop front for Hailsham, which will provide a new shop local initiative for local businesses, supporting them in the town centre. Further information on Hailsham Forward’s town revitalisation plans can be found on their website.